On Tuesday, The Congressional Budget Office updated its annual projections on the health of Social Security and its Trust Funds. In essence, if you're still working and you're depending on that program to cover your retirement -- you'll be in for a shock. Or three. Shocker No. 1: It's failing faster than even last year's dire projection. Data from the Congressional Budget Office. Dollar amounts in billions. Peak two years earlier -- in 2016 rather than last year's 2018 projection. Have $140 billion less in 2022 than projected for that same period just last year. Drain an additional $105 billion in 2023 alone -- just one decade from now. The bad news from last year's CBO projection foretold the three-year shift forward in the projected collapse date of the combined Trust Fund in the 2012 Social Security Trustee's Report. This year's downgrade suggests that last year's 2033 collapse date will likely once again be revised closer -- to 2032 or perhaps even sooner. That 2032 D-Day is less than two decades away, putting it well in the expected lifespan of typical current workers -- and even of some current retirees. Shocker No. 2: Social Security spending will nearly double over the next decade. Not only is the trust fund running out faster than anticipated, but spending is on track to skyrocket -- nearly doubling over the next decade to $1.4 trillion from last year's $0.8 trillion. Combine the rapidly shrinking trust fund with the escalating expected expenses, and the ugly future becomes abundantly clear. Either taxes are going to skyrocket to cover the costs, or benefits will need to be cut. Neither option looks all that good to anyone who expects to be working more than a decade or so from now. Shocker No. 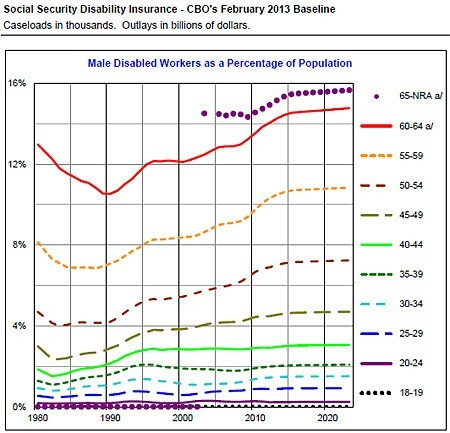 3: Disability claims are high -- and rising. Charts from the Congressional Budget Office. 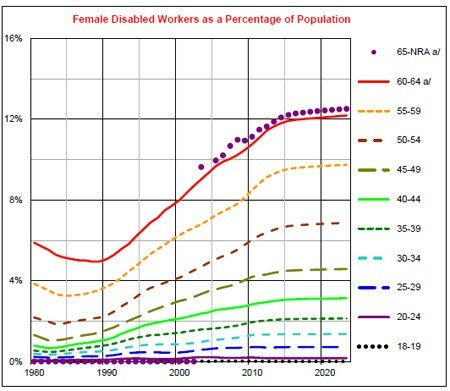 Not only has the percentage of working-age people on disability across nearly all age groups risen fairly steeply over the past two decades, but the CBO is also projecting the levels to continue rising. People on Social Security Disability generally aren't working -- and if they are working, they usually aren't earning much in the way of reliable income . As a result, the CBO's projection suggests fewer people will be paying into the system, while more receive benefits from it. That's not a sustainable situation. It's especially not sustainable when combined with the rapidly shrinking Social Security Trust Funds and the country's quickly aging population. 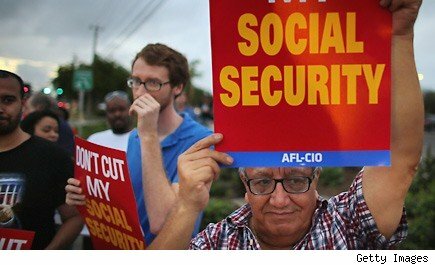 The three shockers from the CBO paint a dire picture, indeed: Social Security's combined Trust Fund is collapsing quicker than anticipated, Social Security costs will nearly over the next decade, and Social Security disability claims are high and still rising. Take it all together, and it's a stern warning of a pending financial catastrophe for a program that over 50 million Americans currently rely on -- and nearly everyone working in the country expects to receive. There's little you can do to stop the collapse of the Social Security Trust Funds, but you can improve your chances for a comfortable retirement anyway. A strong investing approach is to choose great companies and stick with them for the long term. In our free report "3 Stocks That Will Help You Retire Rich," we name stocks that could help you build long-term wealth and retire well, along with some winning wealth-building strategies that every investor should be aware of. Click here now to keep reading. Motley Fool contributor Chuck Saletta welcomes your comments. Try any of our Foolish newsletter services free for 30 days.